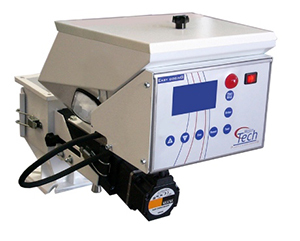 Are Gravimetric Dosing Units Worth the Extra Cost? Gravimetric colour dosing units (also known as continuous or loss-in weight units) have been around for a while, so we asked the PlastikCity Ancillary Partners for some feedback that would help our readers to make a more informed decision when considering their options. We appreciate that despite design improvements (such as inclined feed screws), volumetric units are not as controllable as a unit that utilises load cells to continuously monitor and adjust material flow. Our mission was to see if you can justify the additional investment. Our results were surprising. Current sales levels – What is the current split between the two designs? The average came at to around 65% in favour of Gravimetric. Initial investment – for a single station unit to suit a 250 tonne IMM, what is the approximate price premium involved? The average answer we received was £1100. Accuracy – Are we correct in assuming that to ensure you achieve the minimum percentage of dosing required, e.g. 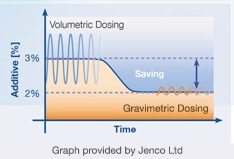 2%, a user should be setting the dosing unit above this threshold if using a volumetric model? If yes, what would be the recommended setting in order to ensure a minimum of 2% is added? The general consensus was that in order to avoid having to continually check weigh sample doses, 3% would be a typical setting. Is this still the case with Continuous dosing technology, and how close to exactly 2% can be reliably achieved? The average figure was 0.1%, so dosing would be set at 2.1%. A typical 250T IMM with 50 or 52 mm screw size producing a component weighing 225g (50% of typical shot capacity) with a 40 second cycle will consume 20.25 kilos of raw material per hour. To achieve a minimum 2% addition of masterbatch, the Volumetric unit will dose a total of approx. 0.61 Kilos per hour, compared to 0.43 kilos in the case of the continuous dosing unit. If we ignore cheaper black and white masterbatch for the purposes of this exercise, a typical coloured universal masterbatch should cost in the region of £5 per kilo when bought in bulk. This equates to an hourly saving of £0.90 when using the more accurate technology, meaning payback (based on the average additional equipment cost provided) would be achieved in around 1200 working hours – WOW! Reduced variation in dosing levels resulting from batch inconsistency of the additive’s specific gravity. Much simpler to set up, no need to calibrate by test weighing. Gravimetric units should still be tested periodically, as load cells and their associated electronics can develop issues over time. Weighing the additive negates any changes in flow properties resulting from factors such as pellet size, surface finish etc. Tighter control of the percentage added provides better product consistency, e.g. colour density variations. Universal masterbatch does not always homogenise as well as the base material, which can lead to areas of weakness in the final product. It is therefore beneficial to not exceed the required dosing level. To acquire comparative quotes for both Volumetric and Gravimetric dosing units from all the UK’s best suppliers visit the PlastikCity Masterbatch & Additive Dosing Unit section. Thanks to our contributors for their excellent input to this Blog.